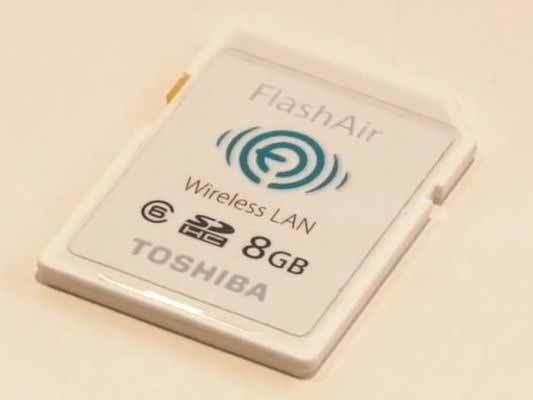 NEW TOSHIBA'S SD CARD CONNECTS THROUGH WI-FI. The technology of SD card has improved in such a speed like the speed of light at first the size of a 250 MB memory was nearly equal to 6 men standing but now it is just smaller than our thumb size as a result now Toshiba has associated a SD which can be connected by wireless LAN standard. This new techno was invented and came into the market before some year. At the at IFA 2011 but with authorization it was actually released successive month and this Toshibas Flash Air Wireless LAN SD card took the people to it in the 2012 CES with a great impressions.This flash air sd card is more powerful than the older Eye-FI cards because this will do more with photo copying and speed of reading and writing and a major feature is the whenever it is into a cam or any device it will be automatically requests which it cam has been connected before. This card cannot be misused because this one has a password lock which is much safer.